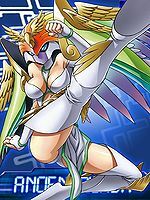 Possessing the attribute of "Wind", it is one of the legendary Ten Warriors Digimon that saved the ancient Digital World. 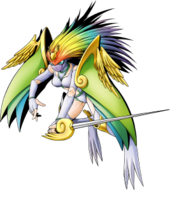 An Ultimate who existed only in the distant past, it has golden wings and a beautiful rainbow-colored figure. With its golden wings it soars around the vast skies, and it is said that by erecting rainbow bridges it can move freely even through the earth and sea. 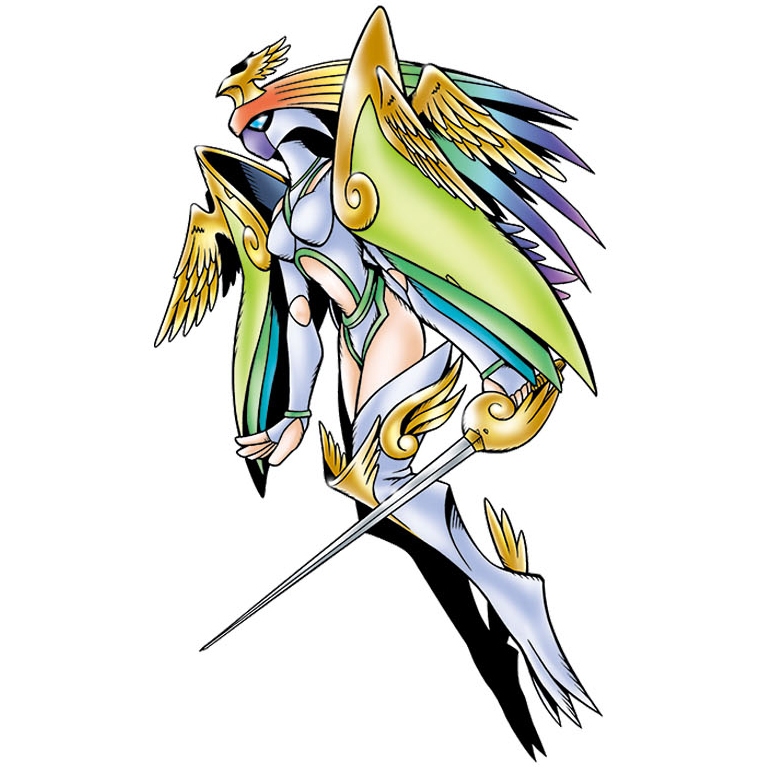 Ancient Irismon's beauty and abilities were later passed on to the "Bird Man" and "Fairy Digimon". 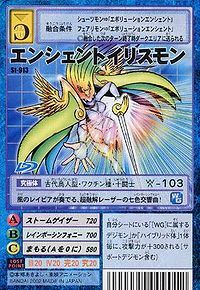 Its Special Moves are continuously generating a colossal storm (Storm Gazer), and firing a super-fused laser that shines with the seven colors (Rainbow Symphony). Title: 「伝説の風の闘士」 — "Legendary Warrior of Wind"
Ancient (「エンシェント Enshento」 means of time long past. Iris (Iρις) 「イリス Irisu」 means "rainbow" and is also the personification of rainbows in Greek mythology. Rainbow Symphony  レインボーシンフォニー Reinbō Shinfonī Releases lasers of seven colors which melts everything it touches. Storm Gazer  ストームゲイザー Sutōmu Geizā Creates a very huge storm that concentrates in one area. 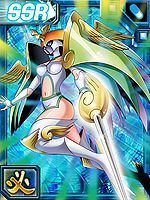 Ancient Irismon was one of the Warrior Ten whose spirit was reborn in the Human Spirit of Wind as Fairimon and the Beast Spirit of Wind as Shutumon. 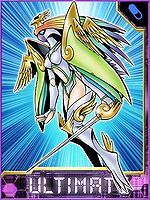 Ancient Irismon appears very briefly whenever Izumi uses the Ancient Spirit Evolution attack. 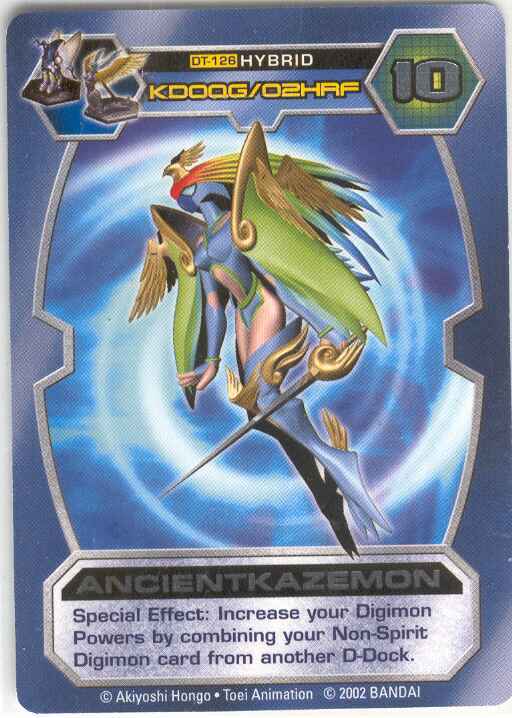 Ancient Irismon can only be obtained as a collectible card. Its card is part of the Warrior Ten (十闘士 Juttoushi) set. 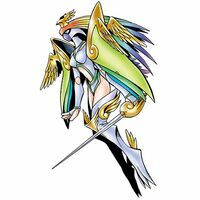 Ancient Irismon is available as a Digimon Medal. 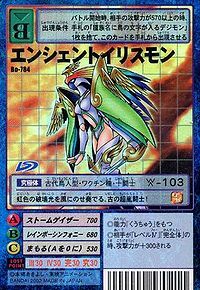 Ancient Irismon appears as a raid boss when you scan rare DDP. Defeating it will give you a rare weapon. Its wind rapier performs, the super-fused laser's Rainbow Symphony! This ancient super-storm warrior plays a rainbow symphony as it rides upon the wind! 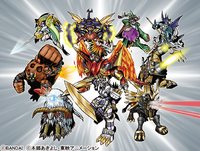 ↑ 5.0 5.1 Digimon Frontier: "Go Beyond Time! The Beginning of a New Legend"